Tom Broussard had his stroke on September 26, 2011. He lost his language and his career without really knowing that he had lost either one. He received an ischemia stroke on the left side of his brain. His right arm and right leg went limp. And he couldn’t see out of his right eye. But he was incredibly lucky in many ways. He received the drug tPA within three hours of the stroke. It is crucial to know that tPA dissolves the clot and prevents a person from permanently losing his or her affected side. What Tom didn’t know was that he acquired aphasia, the impairment of his language. That was the beginning of understanding how a damaged brain can repair itself. Stroke Diary, A Primer for Aphasia Therapy (Volume 1) was published on March 27, 2015. Click here to read Chapter One. 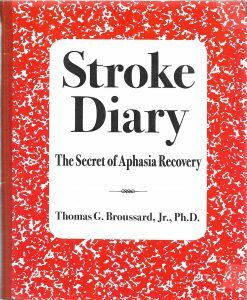 Stroke Diary, The Secret of Aphasia Recovery, (Volume 2) was published on September 17, 2016. 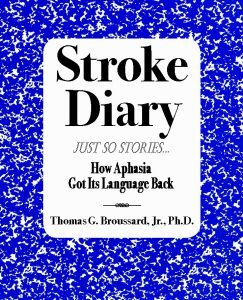 Stroke Diary, Just So Stories, How Aphasia Got Its Language Back (Volume 3) was published on January 23, 2018. It is the final volume of the trilogy. Dr. Broussard is dedicated to helping the national community learn about strokes and, particularly, aphasia. While many people have heard about strokes, few are aware of aphasia, the loss of language that often results from a stroke. Broussard is committed to speaking about aphasia in every state, as part of his “Aim High for Aphasia!” Aphasia Awareness Campaign.